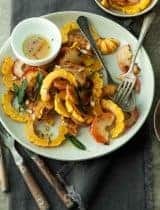 Sliced apples enveloped in a homemade cider caramel sauce makes this paleo and vegan apple crumble the perfect finish to an autumn meal. Crumbles don’t always get the attention they deserve. 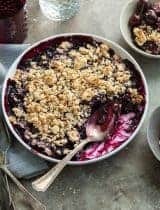 I think everyone should have at least one good crumble recipe in their repertoire because it’s a no-fuss dessert that works for almost any occasion and is always a crowd-pleaser. You really can’t go wrong with a fruit crumble for dessert especially an apple crumble this time of year. It doesn’t get much cozier than a warm apple crumble fresh from the oven on a cool autumn day. There’s just something special about an apple crumble. Easier than a pie, yet just as delicious, the wonderful scent of baked apples envelops the house and instantly creates a cozy and comforting feeling. 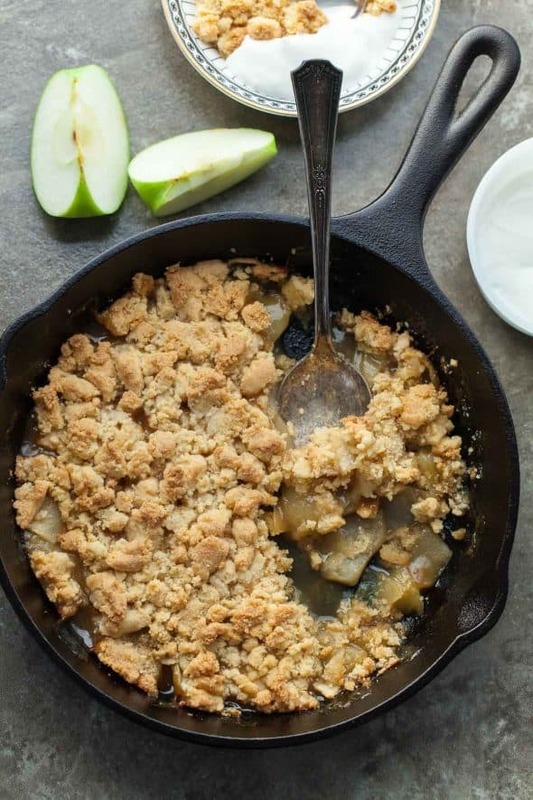 This apple crumble has a secret weapon; a quick homemade cider caramel sauce that’s folded into the apples before being topped and baked. The caramel gives the crumble a whole new flavor, that’s a departure from the cinnamon laced apple desserts we’ve come to expect. 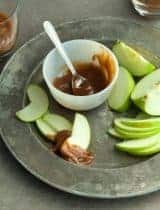 Much like last week’s caramel dip, this sauce gets its flavor from fresh pressed apple cider, this time boiled down until syrupy, then whisked together with coconut cream to create a rich caramel with a hint of tartness that’s the perfect complement to the apple filling. I like to use a mixture of sweet and tart apples (like Fuji s and Granny Smiths) for the filling. 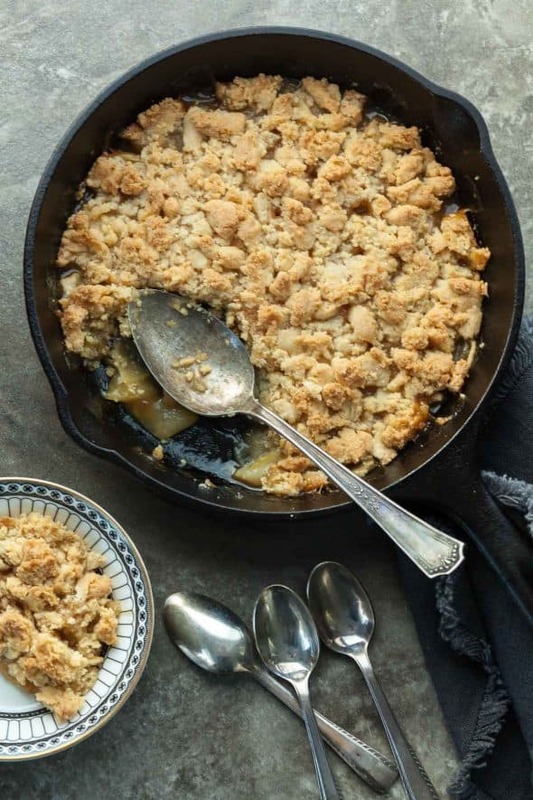 The apples are thinly sliced and tossed with the cider caramel before being topped with the crumble which bakes up crisp and golden. You’ll know your crumble is ready when the topping starts to brown and the filling is juicy and bubbling. In the fraction of the time it would take to make a pie, you’ll have a caramel filled crumble that’s just as welcome at your Thanksgiving table as it is any other meal. In fact leftover crumble for breakfast with a generous dollop of yogurt on the side is one of my favorite fall treats. Grease an 8-inch cast-iron skillet. 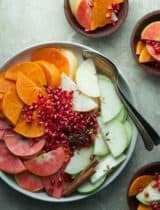 Place the sliced apples in a large bowl and add lemon juice and cider caramel; toss gently to combine. Transfer the mixture to greased 8-inch cast-iron skillet (or other similarly-sized oven proof casserole). 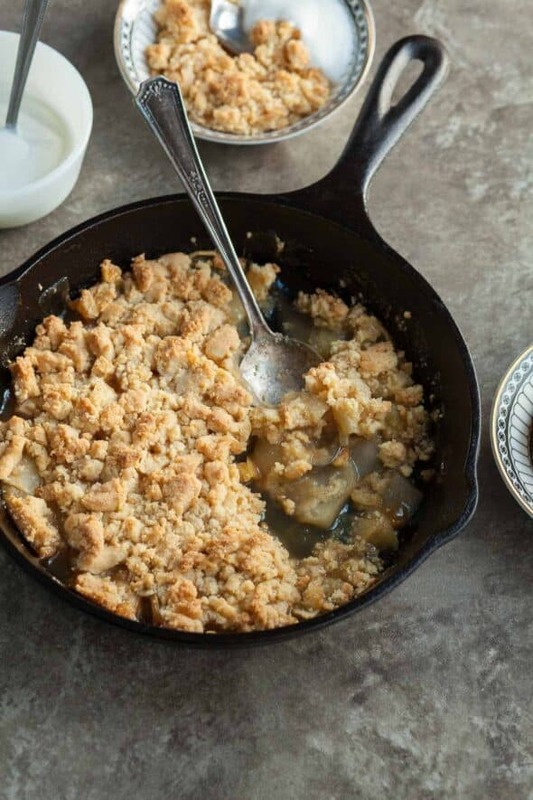 Using your fingers gently break the crumble mixture evenly into clumps over the apples. Bake for 20-25 minutes, or until crumble is golden and the apples are soft. Transfer to wire rack to cool slightly before serving. Serve warm or at room temperature. You can substitute heavy cream if desired. 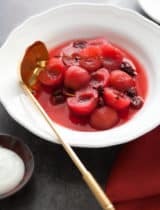 I love it when recipes are able to be eaten for either breakfast or dessert. 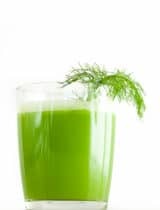 ;) This looks delicious! I. Want. That. Entire. Skillet. Please. Thankyouverymuch. That crumble topping has me all googly eyed! Can I use whole wheat or oat flour instead of tapioca? I haven't tested either substitution so unfortunately I can't say for sure.